Publisher: Viking, 2014. 278 pages. When the village recluse dies and his nephew shows up from Australia to settle the estate, strange things begin happening in Finch. Naturally, it's up to Lori Shepherd and the dead but not departed Aunt Dimity to sort it all out. As with the last couple of Aunt Dimity books, this is a very mild mystery with no corpse, no danger, and minimal sense of any urgency to deal with the problem. The result is a sweet story, but not one that I would call a mystery. I assume that this has been a deliberate move on the part of the author, after venturing into some more dramatic territory a few books back. I prefer my mysteries to have a little more mystery to them, and it is conventional to provide a corpse. So although the story is a fun, quick read, and I'm hooked enough on Lori and the rest of the denizens of Finch to keep reading, I'm not entirely happy, either. Not many of the books have actually involved corpses, but most manage to muster up a bit more peril than this one, and more of a puzzle to solve. I also found most of the resolutions ion this book a bit too predictable, including the "big surprise" at the end. For those who are hooked on the series. Addendum, Jan. 3, 2015: I have just listened to the audio book narrated by Teri Clark Linden, and I have to say that I found the narration irritating. Several women were given rather puny voices that I didn't think went with them at all (especially Emma), and there was a curious hesitation in the speeches of characters that I disliked. I'd say to give this one a miss. 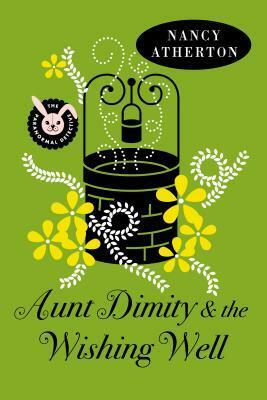 Full Disclosure: I checked Aunt Dimity and the Wishing Well out of my library, and received nothing from the writer or publisher in exchange for my honest review. The opinions expressed are my own and those of no one else. I am disclosing this in accordance with the Federal Trade Commission's 16 CFR, Part 255: "Guides Concerning the Use of Endorsements and Testimonials in Advertising."